Something that became abundantly clear when I started commuting to London last year was that coffee is extremely important to 80% of City workers. It seems the majority of people on the train and in my office simply can’t face the day with at least one cup of the bitter stuff. It’s no surprise then that the coffee shop they buy it from and the members of staff behind the counters become just as important as the people they return home to every night. I’ve heard it called nectar and even life blood but I just can’t stomach the stuff. Even so, I know a good coffee shop when I see one and it may come as some surprise that I’m about to be incredibly positive about a coffee shop called Harris + Hoole. For those of you who don’t know, Harris + Hoole are a unique breed of coffee shops. Set up by the three siblings brainchild of three siblings – Nick, Andrew and Laura Tolley the vision was (and still is) to bring great tasting speciality coffee to the high street, and they’ve done just that! We have a Harris + Hoole in Southgate. Aesthetically it really stood out for us. With wooden panelling painted a beautiful shade of green (my favourite colour), trendy clean cut graphics and a fantastic atmosphere we had to give it a go. Our first visit to the coffee shop was on the weekend we moved in. We’d clocked H+H on each of our visits to Southgate and vowed that if we moved here, that it would most definitely become our local coffee shop. We still have grand plans of lazy Sunday mornings reading a book on their comfy sofas, or attending some of their community events – I can get help with my writing at their writer’s group don’t you know – though with all of our busy weekends we haven’t quite had the chance just yet. Nonetheless, we’ve remained incredibly impressed by our first couple of visits in those first few weeks. Some of you might be asking why this should come as a surprise? And you might be wondering what the problem could be with a community focussed artisan coffee shop in the London suburbs? 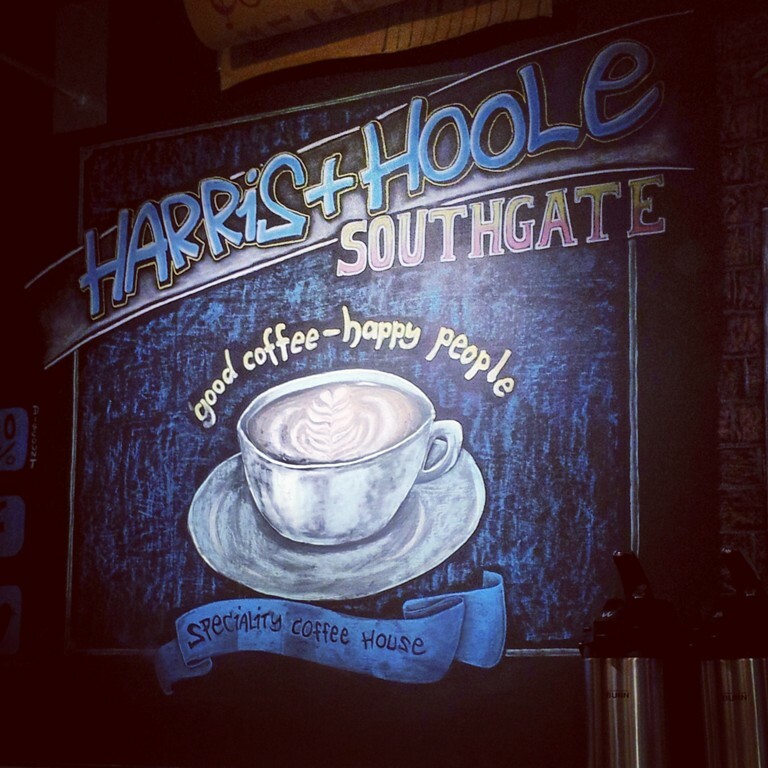 Well…controversy arose earlier this year when it was discovered that Harris + Hoole’s shareholders include Tesco’s. Now I don’t know the ins and outs of things. What I do know, is that if they don’t have a controlling stake (i.e. more than 50%), then legally they cannot block the Tolleys, nor force their hand into making decisions they wouldn’t have otherwise made. If the Tolley’s are “selling out” then they are doing so of their own free will. Normally I am one of those people who like to champion entrepreneurs and local businesses so if Harris + Hoole are fast becoming another corporate chain, why am I still willing to support them? I’ve already mentioned the fantastic atmosphere; generated by the lighting, decor and awesome people who chose to eat and drink there. Personally I also love the choice. I’m not a coffee drinker, and although their speciality coffee is really what their business is all about, they have a far more sophisticated choice of drinks for those who don’t drink the bitter stuff. I for one love my herbal teas, and here I can chose from the Iron Goddess of Mercy Oolong among others or pick from their ice tea menu. Unlike real chain coffee shops like Costa and Starbucks when you order an iced toffee you’re not served up some nasty lukewarm syrupy drink but instead a properly brewed ice tea. The baristas also need a special mention – the guy working behind the counter in Southgate is a true artist. 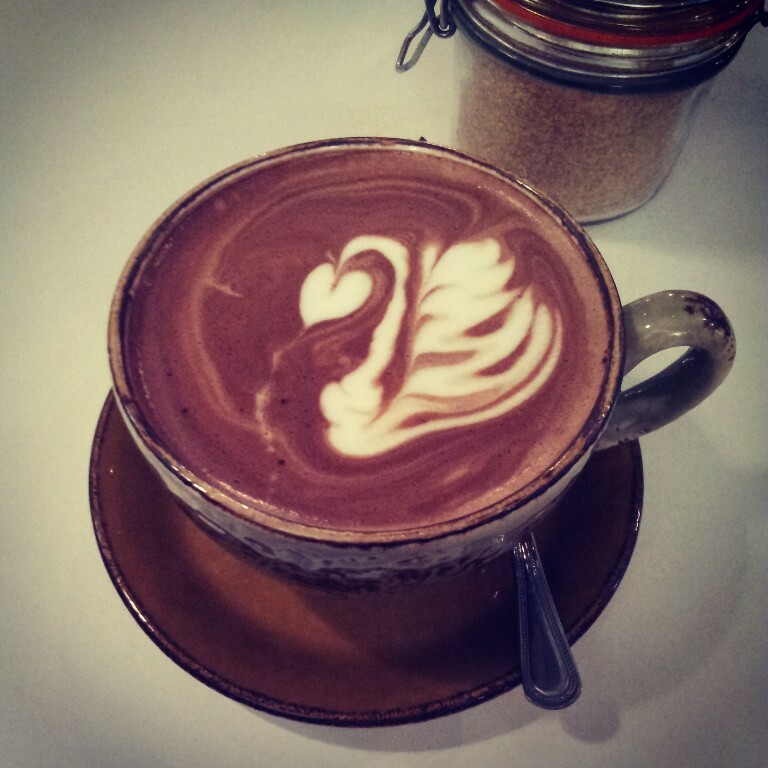 We’ve had a whole host of decorative coffees included swans, feathers and flowers! If you’re in or around North London it’s worth visiting just to see what masterpiece you get served. 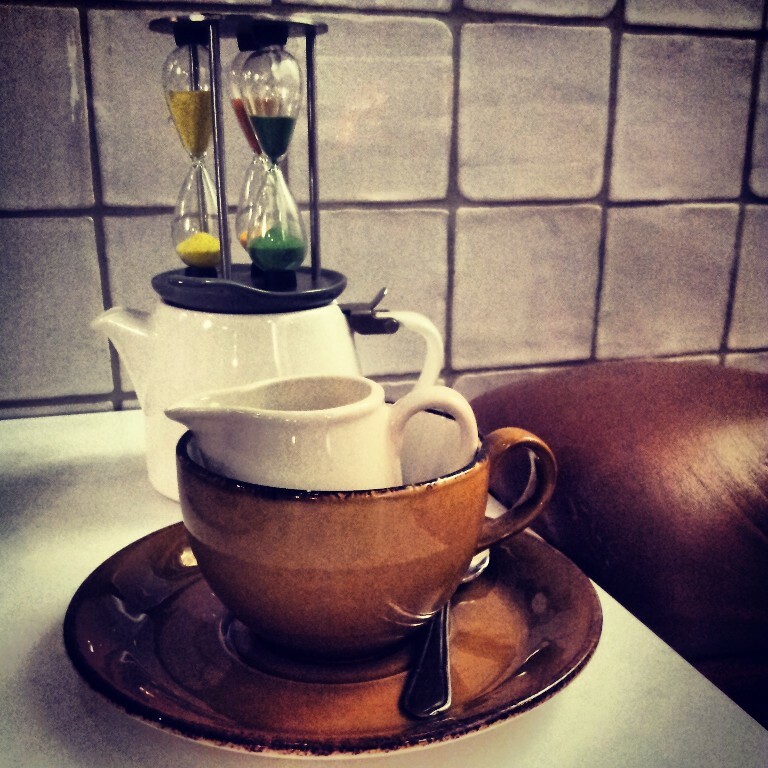 I also love the little touches like the tea timers – set up 1, 2 or 3 minutes, simply choose how long you like your tea and watch the timer. This means you get the perfect brew every time! Lastly, even if there is a corporate giant lurking in the background, Harris + Hoole have done a fantastic job of keeping their own community focussed identities. Southgate in particular has a real community feel with a whole host of different classes from writing to languages and dance centred round the coffee shop. One of the highlights is the giant chalkboard tree which shows you up and coming events. You also can’t fault the service – even beyond the amazing barista who is a true artist, the girls behind the counter are always cheerful and up for a chat. When so many of us can’t survive without a shot or two of caffeine in the morning it’s no wonder that coffee has become big business. Can we really fault family run business like Harris + Hoole that are on to a winner taking the chances offered by companies like Tesco? If it means I get to appreciate their hard work for longer, then for now I am happy! Do any of you live near a Harris + Hoole? Did you know it was partly owned by Tesco, and what’s your opinion?